Four new species of horseshoe bats have been discovered in East and Southern Africa, after scientists pieced together clues such as DNA data and the most intense frequency of sonar calls of each of these flying mammals. Two of the species have been named in honour of dedicated Southern African conservationists – Ms Lientjie Cohen, a scientist of the Mpumalanga Tourism and Parks Agency in South Africa, and the late Zimbabwean Dr. Reay Smithers, author of Southern Africa’s most comprehensive mammal anthology. A third species is named after Mount Mabu in honour of the largest rainforest in southern Africa – an area under severe threat – in which it resided. The fourth new species is found in Mozambique. The discoveries are described in the latest edition of the open source journal PLOS ONE and can be downloaded freely from http://dx.plos.org/10.1371/journal.pone.0041744. The investigation was led by bat experts and evolutionary geneticists Prof Peter Taylor of the University of Venda (South Africa), Dr Samantha Stoffberg of Stellenbosch University (South Africa), Prof Ara Monadjem of the University of Swaziland, Dr Corrie Schoeman of the University of KwaZulu-Natal (South Africa), Dr Julian Bayliss of the Conservation Science Group at the University of Cambridge (United Kingdom) and the Mulanje Mountain Conservation Trust in Malawi, and Dr Woody Cotterill of Stellenbosch University and the Africa Earth Observatory Network (AEON). 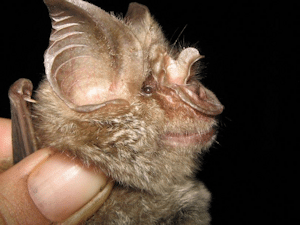 The new species are Cohen’s Horseshoe Bat (Rhinolophus cohenae), Smithers’ Horseshoe Bat (Rhinolophus smithersi), the Mozambican Horseshoe Bat (Rhinolophus mossambicus) and the Mount Mabu Horseshoe Bat (Rhinolophus mabuensis). It was previously thought that only one type of large horseshoe bat, Hildebrandt’s Horseshoe Bat (Rhinolophus hildebrandtii), found widespread throughout East Africa and the tropical habitats of Zimbabwe and the Mpumalanga province of South Africa. The researchers compared key characteristics of the bats, including sonar calls, their skull shape, genitalia, and crucially divergence in DNA sequences to diagnose and classify the new species. The definitive DNA studies were conducted by Dr Samantha Stoffberg, a postdoctoral researcher in the Evolutionary Genomics Research Group of the Department of Botany and Zoology at Stellenbosch University. Thanks to discoveries made in Zimbabwe in 1980 of so-called Hildebrandt’s Horseshoe Bats that did not quite fit the bill, scientists were first alerted to the fact that further investigation was needed. More anomalous populations of Hildebrandt’s Horseshoe Bats were discovered elsewhere a decade later, notably in Mpumulanga, and then more recently in Mozambique. “But solving the puzzle had only just begun,” Dr Woody Cotterill of Stellenbosch University remembers their trail of discovery. Species specific sonar calls are measured by differences in peak echolocation frequency. Frequency differences are diagnostic between species. Field workers can measure these frequencies with the help of bat detectors to identify these cryptic species in the wild. “Once we started comparing museum specimens from these populations, we then noticed statistically significant differences in the body size and skull shapes of these bats across the region,” says Prof Taylor. Interestingly, here the largest “giant” species turn out to be restricted to Afromontane habitat islands on mountaintops in Mpumulanga and Mozambique, while the smaller “dwarfs” occur at lower altitudes along major river valleys. • Cohen’s Horseshoe Bat (Rhinolophus cohenae) was first discovered by Mpumalanga Tourism and Parks Agency scientist Lientjie Cohen in 2004 in the Barberton Mountainlands Nature Reserve near Barberton. Cohen is an active member of the Gauteng and Northern Regions Bat Interest Group. “We are naming this bat species after Ms Cohen to acknowledge her significant contribution towards the conservation and discovery of new bat species in South Africa, and particularly in Mpumalanga,” says Prof Peter Taylor of the University of Venda. Cohen’s Horseshoe Bat (Rhinolophus cohenae) has the lowest call peak frequency of the five Rhinolophus species under investigation. It has a very wide noseleaf. “I am not aware of any other bat species being endemic to Mpumalanga Province, which would make this species one of great conservation importance,” adds Prof Taylor. • Smithers’ Horseshoe Bat (Rhinolophus smithersi) was first collected in 2000 by Prof Taylor and Dr Cotterill in northwestern Zimbabwe. It has the highest echolocation frequency of all the members of this species-complex. “So far it seems to be only found in the northwestern regions of the Zambezi escarpment in Zimbabwe, and remote areas of the Kruger National Park around Pafuri, and the Soutpansberg Mountains in Limpopo,” says Dr Woody Cotterill of Stellenbosch University. Smithers’ Horseshoe Bat is named after the late Dr Reay Smithers, founding director of the National Museums of Zimbabwe. The remarkable legacy of his commitment to taxonomy and museums is represented in the largest scientific collection of mammals in the Southern Hemisphere, in Bulawayo’s Natural History Museum. Dr Smithers fostered its growth for over three decades. “He was a prodigious collector and researcher of mammals including bats, and the author of important regional texts on the mammals of Botswana, Zimbabwe and Mozambique,” says Prof Taylor. 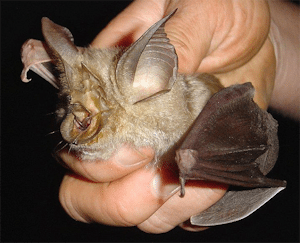 • The Mozambican Horseshoe Bat (Rhinolophus mossambicus) is a medium-sized species in the complex. It appears widespread, recorded in Mozambique and northwest Zimbabwe. • The Mount Mabu Horseshoe Bat (Rhinolophus mabuensis) has so far only been found around Mount Mabu and Mount Inago in northern Mozambique, but could possibly also live in the nearby Malawi Rift, and Namuli, Chiperone and the Mulanje mountains. The first museum specimens of this species were collected during an assessment of the biodiversity of mountains across northern Mozambique above 1500m, which was made possible through a British government funded Darwin Initiative award. The assessment project is coordinated by Dr Julian Bayliss. 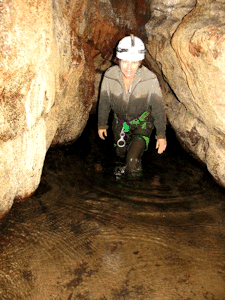 The area is known as one of Africa’s most poorly explored territories.